This morning started, like too many before it, with fog. 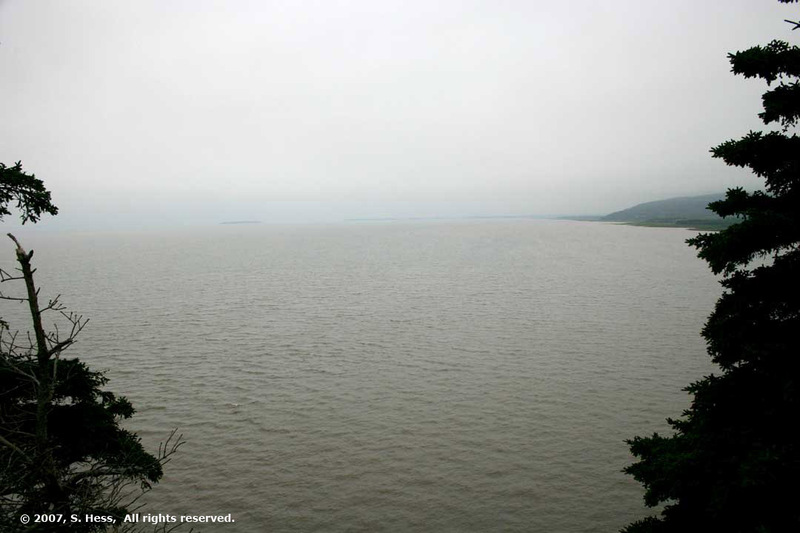 The fog burned off fairly quickly but it remained cloudy and hazy. This frustrates me as a photographer, in that the light is “flat” and this tones down some of the details and colors. Even trying my hand with software magic and filters, I can only recover some of what is lost. 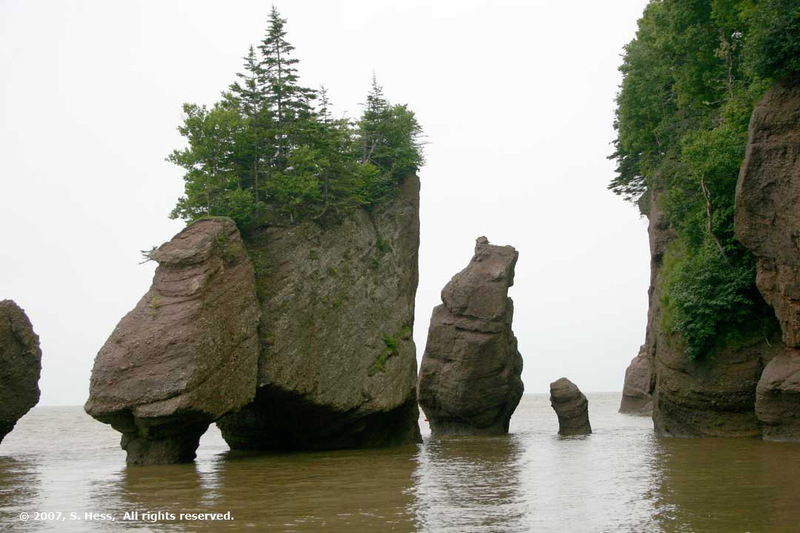 Our plan was to go back to Hopewell Rocks and get pictures, similar to those I posted yesterday, but at high tide. High tide today was at 9:48 am, Atlantic Time and we got to the rocks at about that time. 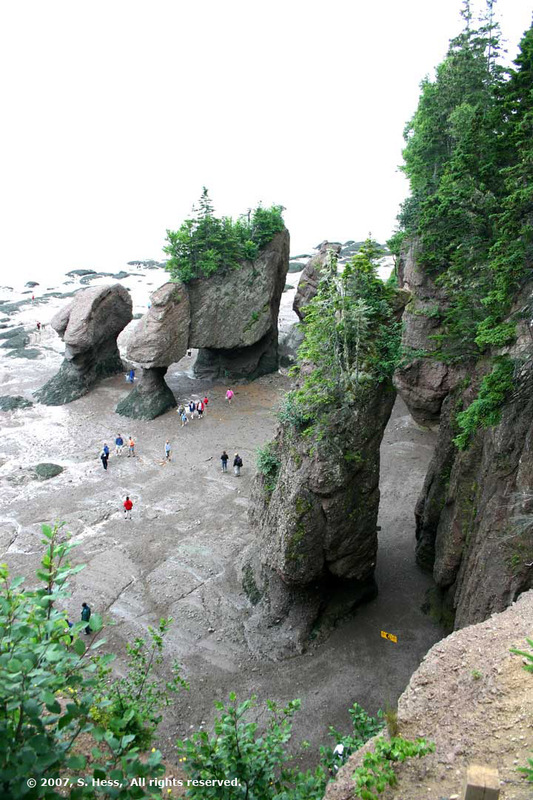 Having read about the Hopewell Rocks and Bay of Fundy Tides in a number of publications and on the Internet, I had expected that the water would cover the rocks to a higher level. 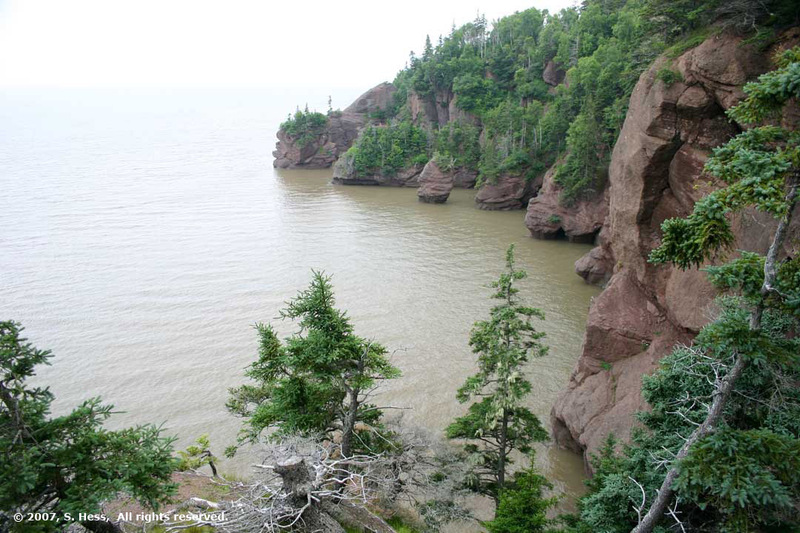 As I stated yesterday, the tide difference at Hopewell Rocks is supposed to be about 15 meters. It seemed to me that the difference between what I saw at low tide and what we had before us today was about 6 meters (18 feet). 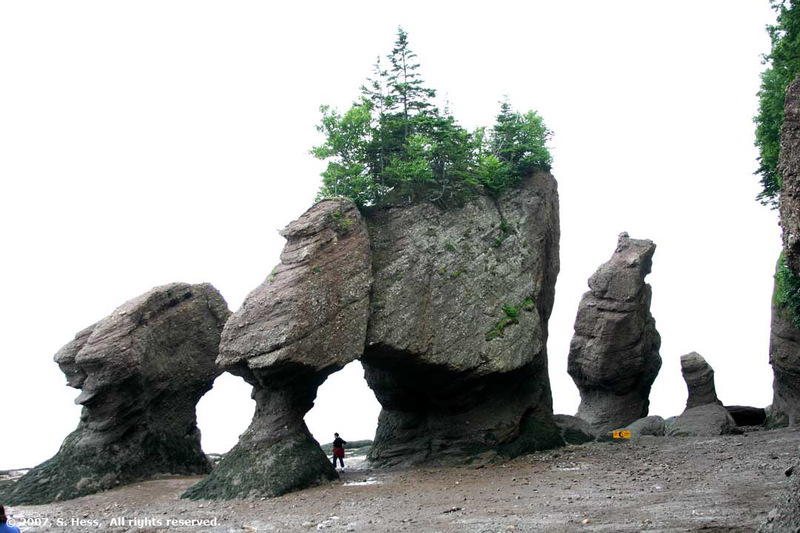 It is somewhat difficult to gauge the difference just by looking at the pictures of the rocks at high and low tide. What none of the pictures I took yesterday really show is how much lower the low tide line is below the base of the rocks. 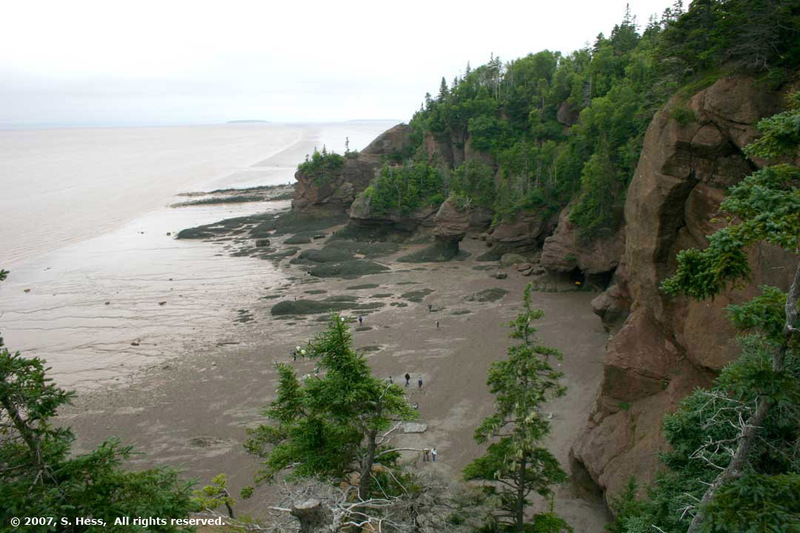 The slope of the beach at the base of the rocks is relatively shallow and the distance from the base of the rocks to the low tide line is, by my estimate, about 100 meters (300+ feet). 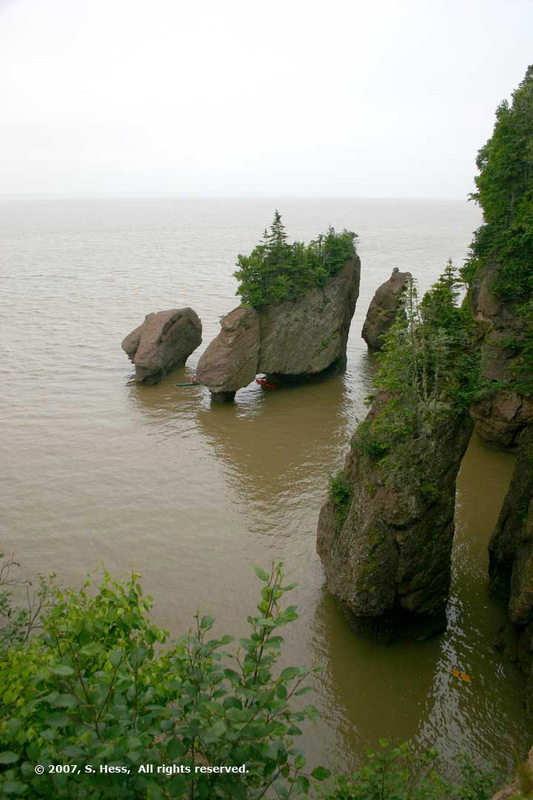 It is therefore quite possible that there is a rise in the tide of several meters before the water even reaches the base of the rocks. In any event, I don’t think that the difference is anywhere near the maximum difference in the publications. 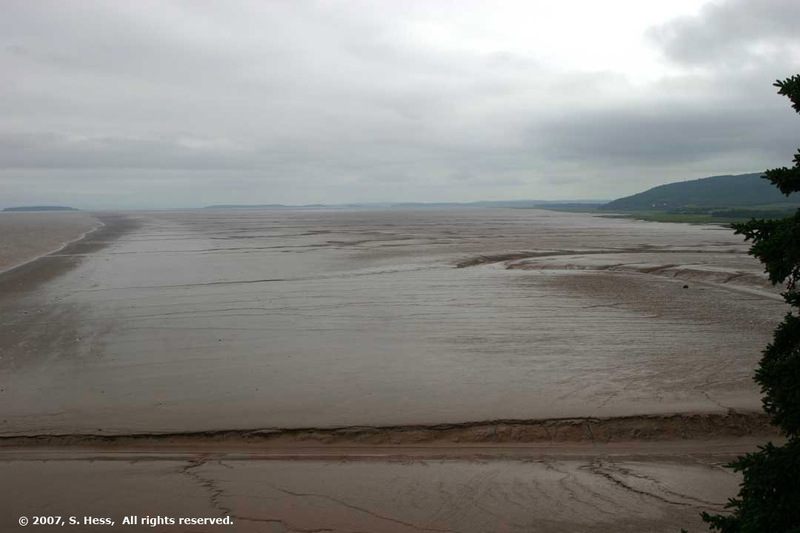 I imagine that if we were here at Lunar High Tide, we might come closer to 15 meters. 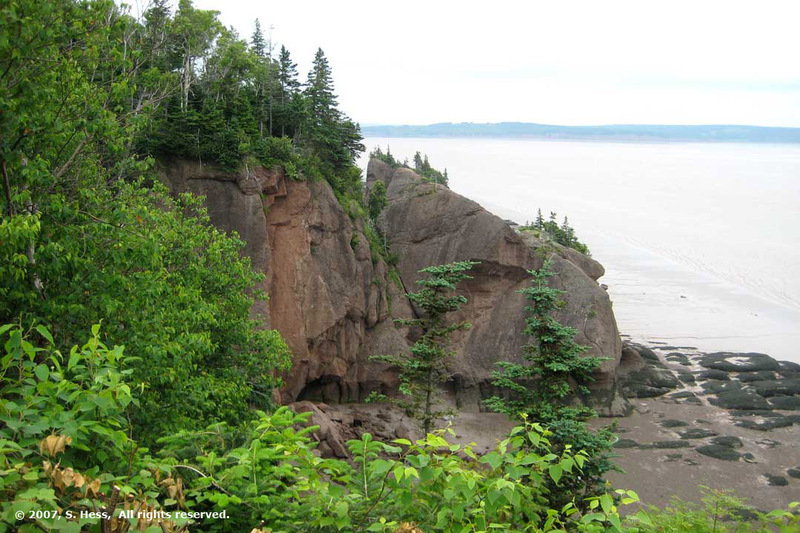 After viewing the Hopewell Rocks, we drove into Moncton, about 25 miles from Hopewell Cape. 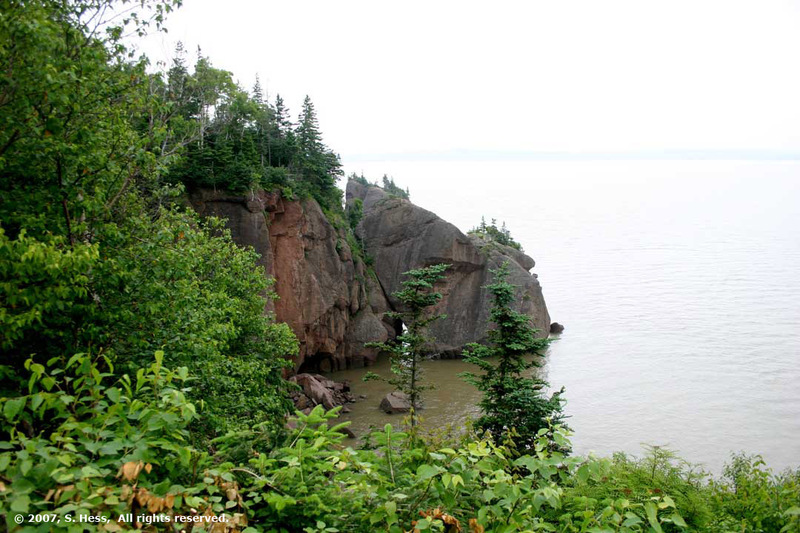 Moncton is a fair size city and what we saw of it was much more lively than St John. We didn’t really take in any of the sights of the town because our objective was to do some restocking of our pantry and refrigerator as well as some vehicle maintenance items. We found a large mall, the first we had seen since we left the Boston area, and did all our shopping in that one spot. What we found very interesting is that we did not see one supermarket in the 25 miles we drove from the campground to Moncton. Where do the folks around here shop for food?